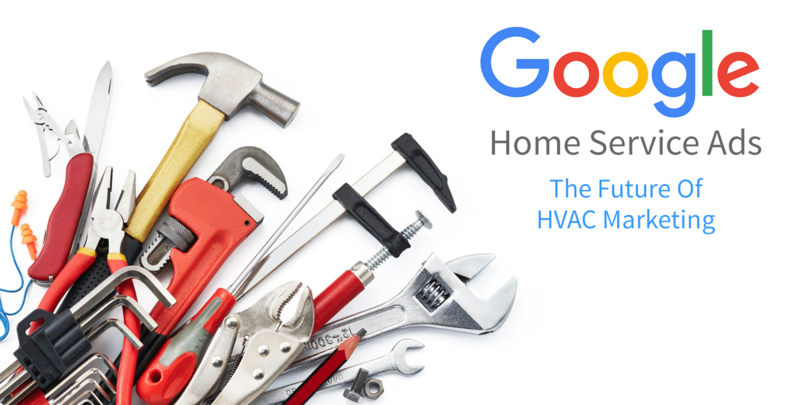 Google Home Service Ads (HSA) represents an additional digital marketing arrow in your quiver of techniques—one of the most advantageous HVAC Marketing channels yet. It’s uniquely oriented to get your site to the top of Google’s search results, and the top of your prospects’ minds. 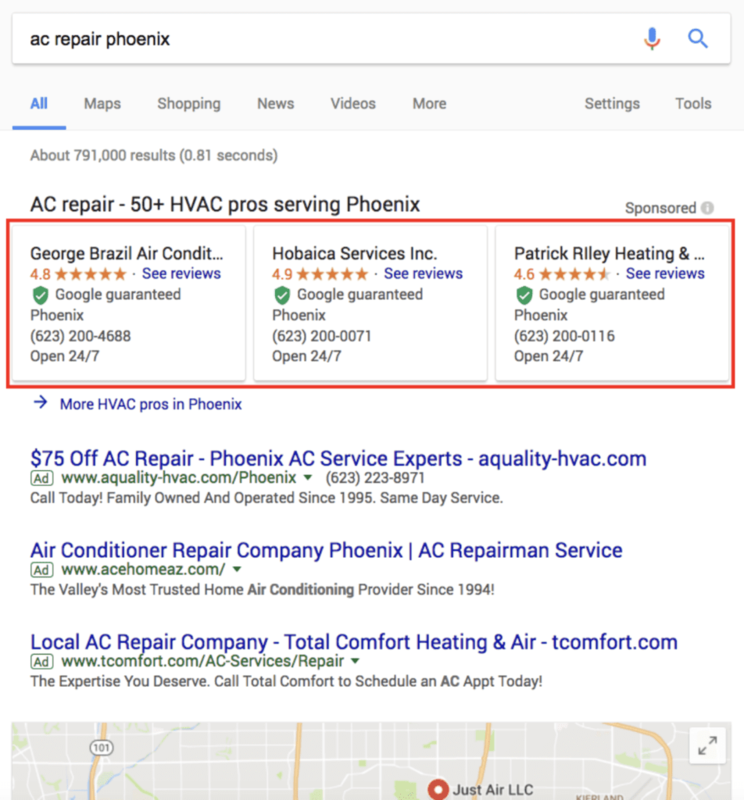 For instance, when you Google “ac repair phoenix”, these ads appear before any others. If the beta program succeeds, we expect a strong likelihood of it spreading nationally. Why Use Home Service Ads? 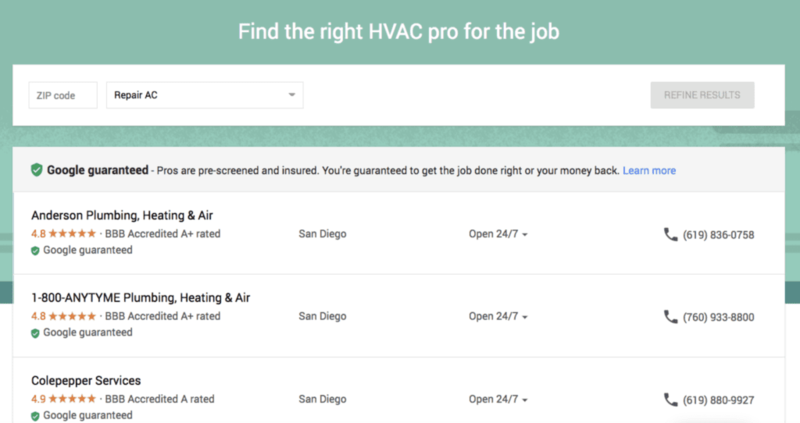 In the event of a homeowner searching for a Local HVAC Contractor, the Home Service Ads would be displayed at the top of Google’s search results. This gives you another great tool to use in order to get on top and stay on top. The Google Guarantee is a great way to set yourself apart from the competition. The prospect views you as more credible, and even has a $2,000 “insurance policy” from Google. You are charged on a flat-fee basis per lead generated (meaning you won’t have any surprises when setting your marketing budget). This fee is based on your industry and geographical location. When using Home Service Ads, you’ll be ranked based on your proximity to the searcher. The closer your headquarters is to the searcher, the higher you’ll rank. The downside, of course, is that you can’t do anything to improve your ranking for people on the outskirts of your area which is rather unfortunate. Bottom Line: Home Service Ads is a fantastic tool for targeting prospects close to home. But you’ll still want to invest heavily in PPC and SEO to reach people further away. Total coverage is the best policy. Here’s a vital distinction to understand. A PPC ad takes you to a dedicated landing page specific to your company and services. A Home Service Ad, by contrast, takes the prospect to a page of other Home Service contractors. So for every lead you get with this method, you’ll still be in direct competition with 1-2 other HVAC Contractors. Home Service Ads are absent for installation-based services, which limits their applicability for some HVAC businesses. 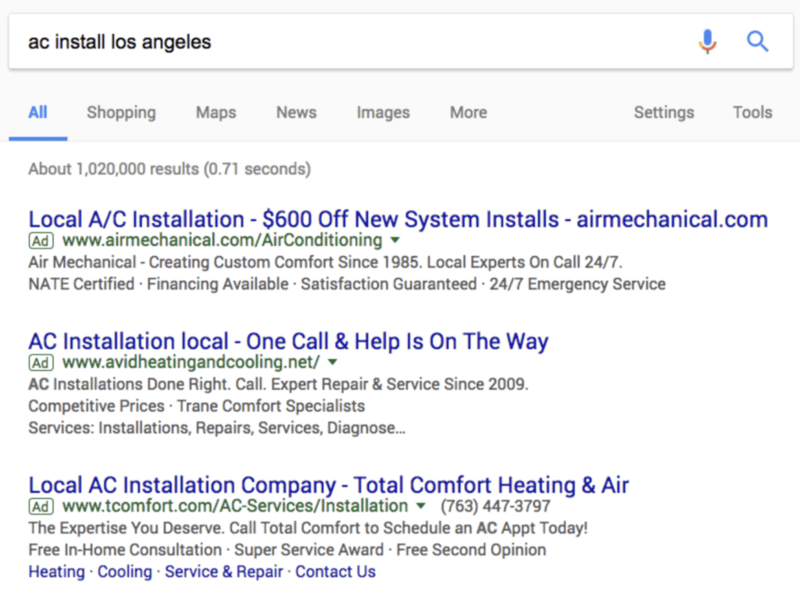 For instance, doing a search for “ac install los angeles” will turn up a variety of PPC ads, but no Home Service Ads at all. Ready To Sign Up for Home Service Ads? Background Checks: Your HVAC business will need to submit to background checks by a third-party security and risk-management firm. License Checks: As an HVAC Contractor, you are legally required to hold certain professional licenses according to your jurisdiction. Insurance Checks: Your companie must carry appropriate insurance for all work carried out. Reputation Assessment: Google will also take time to monitor and assess your wider online reputation. So if your online reviews aren’t quite up to speed, we highly recommend fixing that by asking your satisfied customers for reviews. Want to learn more about Home Service Ads? Click here to connect with an HVAC Marketing expert at Gorilla Webtactics. We can help you sign up for the beta program if Home Service Ads seems as beneficial to you as it does to us.